Today’s result was brilliant, and almost makes up for Goodison Park – we rode our luck, though, and it could easily have been a draw or worse. Some of our defending was calamitous (I was one missed tap-in away from another Bassong-related rant), and the goal was no exception. Thankfully, we’ve largely cut out the goals conceded from set pieces, but this is not good, and no doubt the players will be watching it back in training tomorrow. We set up to defend the corner with Modric on the near post, Bale the first screen, but nobody on the back post. 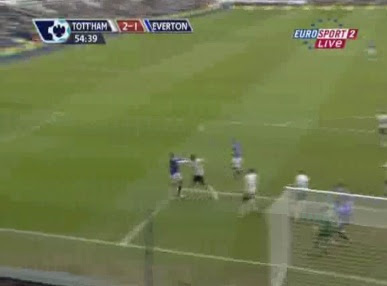 Yakubu makes his intentions clear from the start, by positioning himself near to Gomes – who is marking him? Arteta loops a corner in to the far post, where Rodwell has pulled away from Corluka. It’s not great defending from Corluka, but in these situations it’s not always easy to get to the ball ahead of an attacker who perhaps knows what’s coming. Rodwell’s header is a decent one, but we are still relatively well set to defend it. Well, we would be were somebody marking Yakubu. Pavlyuchenko, Dawson and Gomes – you’d be looking for one of them to deal with this ball before it can find a way to the unmarked player in the 6-yard box. Alas, no. Pavluchenko reacts too late, and misses his kick. Dawson, presumably expects the goalkeeper to deal with it, and doesn’t react. Gomes… well, he just kind of falls over. 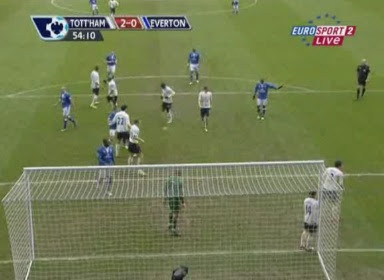 A better angle shows that Gomes has got himself into a poor position, and hasn’t got a great view. When he dives, therefore, he just misses the ball completely. And Yakubu prods home, under limited pressure from Dawson and Modric. A really, really disappointing goal to give away. But we were asking for it for much of the game – Gomes looked nervous on crosses, and had already fumbled a simple catch (fortunately Dawson rescued him with a superb block). lousy second half, i almost couldn't carry on watching. palacios also gave balls away too easily. and i think we should NOT put Kaboul on, i'm beginning to think he's a waste of money and space. Windy we did well to beat Everton 2 i call them Everton 2 because if you seen them in Portugal they where like the team that got thumped 5-1 by Arsenal slow and to be frank rubbish even Howard. I warned on another blog that Everton would speed up especially in the second half this is a speciality of there neighbours the the well nicknamed Duracell Bunnies and the team whose manager said we will finish fourth and there form since backs him up and to think they are the reason i cant watch Spurs playing these energized teams so a good win under the circumstance and lets hope Huddlstone is not badly injured or we will suffer . Whatthefook Kaboul did wrong? Only a moron can find something to complain against him today. Agree. I had my head in my hands when Kaboul came on, but he actually did pretty well and, while he can't pass like Tommy H, he's stronger in the tackle and in the air. If THud is out for a few weeks, which is likely, then thwere's no option other than to bring back Jamie O'Hara. Replays show that Gomes was deliberately obstructed but he doesn't seem to raise any objections. Kaboul did ok. Don't let's reject him too soon again. He was playing out of position on both occasions. 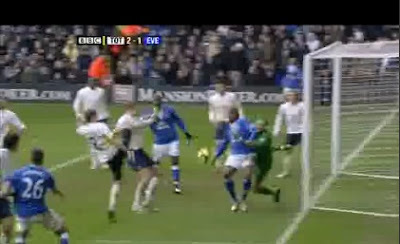 I've added an image of Gomes going to ground - there's certainly no foul as far as I'm concerned. Dawson juts lets Yakubu walk past him whilst he's pointlessly 'geeing' everybody else up. Then compounds this error by ball watching as the corner sails over his head. Gomes went back a year too yesterday - his confidence was shot after dropping the first cross - he was never going to get the ball coming round Yak like that. Finally Pav should've just knocked it out for a corner instead of trying the overhead. Schoolboy from start to finish really.